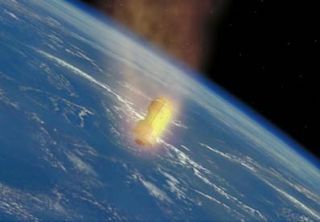 Artist's concept of the HTV's re-entry. Packed with garbage from the International Space Station,the first HTV cargo freighter met a fiery demise over the Pacific Ocean onSunday, punctuating an historic chapter in the Japanese space program. The 33-foot-long cylindrical spaceshipbarreled into the upper atmosphere around 2126 GMT (4:26 p.m. EST) over thePacific Ocean just off the coast of New Zealand, according to the JapanAerospace Exploration Agency. The H-2Transfer Vehicle fired its engines three times Sunday to slow its speed by199 mph, just enough to drop its orbit into the atmosphere and fall from space. The final engine firing lasted eight minutes and wrapped upat 2101 GMT (4:01 p.m. EST) as the spacecraft flew near the southern half ofJapan. Although Japanese officials expected the bulkof the freighter to burn up during re-entry, some chunks of the spacecraftcould have hit the Pacific Ocean. The ship's propellant tanks were most likelyto have survived. "Most of the vehicle components are expected to bedestroyed and burned out encountering the aerodynamic heating during there-entry, but some of the debris is estimated to survive and fall into theSouth Pacific Ocean," JAXA said in a written statement. Debris from the HTV would have likely fallen in arectangular box stretching across the Pacific Ocean between New Zealand andSouth America, according to JAXA. The HTV mission's ending Sunday closed out a 52-day inauguralmission that began in the wee hours of the morning Sept. 11, Japanese time,at the picturesque spaceport on Tanegashima Island off the southern coast ofJapan. Launching on an H-2B rocket specifically built for thelogistics ship, the HTV spent a week undergoing orbital trials before it wascleared to approach the space station. The craft closed within 30 feet of the complex Sept. 17,close enough for astronaut Nicole Stott to grapple the free-flying HTV usingthe station's robot arm. The arm berthed the ship to the Earth-facing port of theoutpost's Harmony module, where it stayed for 43 days. The product of more than $1.1 billion in rocket andspacecraft development, the first HTV brought about 7,500 pounds of suppliesand experiments to the space station. Comprising about 2,000 pounds of that mass were two Earthscience experiments mounted on an exposed platform on the HTV. Both payloadswere attached to the outdoor science deck of the Kibo laboratory module. The NASA HREP instrument carries two experiments to studythe oceans and atmosphere. HREP's ocean sensor will focus on coastal features,and the atmospheric ultraviolet and visible instrument will look at theionosphere and thermosphere. JAXA's SMILES experiment will detect trace gases in theozone layer using a submillimeter sounder. The 1,047-pound instrument will helpdetermine the extent of human activity's affects on ozone. About 5,475 pounds of supplies were hauled to the stationinside the HTV's pressurized section. This cargo included food, computers, experiments, crewprovisions and other maintenance equipment. After unloading the supplies, the station residents packedthe ship with trash to free up storage space on the complex. The HTV was filledwith 1,600 pounds of garbage when it left the station Friday. Six more HTV flights are on the books, flying at a pace ofabout one per year through about 2016. The next Japanese cargo mission isslated for the end of next year. HTV missions will be a key part of the resupply strategy forthe space station after the space shuttle's retirement next year. After the shuttle is removed from service, the HTV will bethe only spacecraft capable of delivering large external hardware to thecomplex, such as science experiments and spare parts called Orbital ReplacementUnits, or ORUs. The last few shuttle flights are filled with ORUs to stockthe station with replacement equipment. Europe's Automated Transfer Vehicle, which first flew lastyear, can't carry unpressurized equipment. The venerable Russian Progresslogistics freighter is also restricted to pressurized cargo. New spacecraft being developed by SpaceX and OrbitalSciences Corp. could accommodate larger payloads for the station's exterior,but both ships may not be operational until 2011.